TV’s, DVD players, cell phones, iPads, iPods, coffee pots, microwaves, refrigerators, dishwashers, mixers, ovens, stoves, computers, printers…. What do these things have in common? Technology? Yes. They’re expensive? Yes. They all have manuals. Yes! I don’t know about you, but I feel like I’m constantly overwhelmed with paperwork. Excessive, bulky manuals don’t help the situation. Some people file them. Some people put them in a drawer. Others just throw them away! If you want to keep your manuals but don’t want to have to move into a bigger house to store them, try going paperless by utilizing online services. I recently came across ManualsOnline.com. They have hundreds of thousands of electronic manuals. You can create an account and bookmark all of your manuals for easy reference. If they happen to not have a manual for one of your items, you can request that they notify you when it becomes available. Companies often have electronic versions of manuals on their website. If they have one for your product, you can bookmark it using del.icio.us. I’m a big fan of del.icio.us! First of all, you can tag your bookmarks. Tags are basically key words that you can use at a later date to find what you’re looking for. Kind of like files in a filing cabinet. For example, you can tag all of your manuals “manuals”. That way when you’re searching for a particular item, you can bypass all your other bookmarks and just review the relevant ones. You can further categorize your manuals by adding additional tags like “microwave” and “computer”. For further information, read this del.icio.us tutorial. Do you have a system in place for organizing items like household manuals? 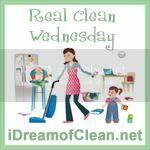 Now it’s your turn to tell us what you’ve been cleaning or organizing this week. Link up and share a tip (or just brag on your little ones)! I even go online and read the manuals of items that I am considering purchasing to see if it is worth it because the commercials and the reviews do not go into the care and feeding of the products and rarely go into restrictions of use. It is very disappointing to get an item for something specific only to find out that using it for that invalidates the warranty. Great idea!! I normally keep mine & then can’t remember where I put them! I keep all of our manuals in our filing cabinet. Needless to say, the folder is OVERFLOWING!! Thanks so much for this tip! I’m signing up right now! 🙂 Love your blog! .-= Catie´s last blog ..I’ve Been Thinking.. Don’t Worry – I Didn’t Hurt Myself… =-.